The 21-inch Black SwissGear Sion (6283202161) is a hot new release carry-on luggage with a modern design and a sturdy build. It is an imported travel item with a scuff resistant polyester fabric exterior, fully lined with interior polyester lining and large and smooth zippers. It includes two reinforced padded handles on the side and the top to lift it easily and a telescoping handle that moves up smoothly and locks for your convenience. The adjustable handle works very well for both shorter and taller people. You can maneuver it easily on different surfaces and in narrow spaces with its four 360-degree rotation multi-directional spinner wheels that swivel around easily. 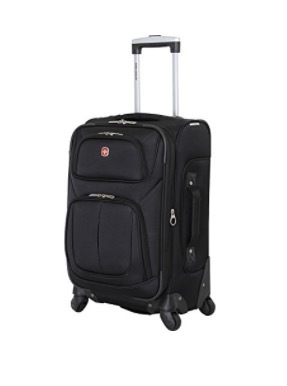 SwissGear Sion weighs about 8 pounds and measures 20H x 13.5W x 7.5D inches (not including the wheels and the handle) which make it suitable for most American and European cabin luggage size requirements. You have the option to extend it and the depth goes from 7.5 to 9.5 inches. There are two exterior zipper pockets (one large and one small) at the front you can fit in a standard tablet in there or some documents and small items, but not a laptop. 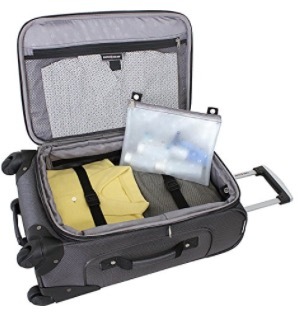 Whether this one will be adequate for a certain amount of travel will depend on what you put in it. But being a smaller 21″ carry-on size bag, it will not be enough for long travels or where you need to pack quite a few winter clothes and shoes etc. for. It is a bit small for large clothes and more than two pairs of shoes. You also need to consider the weight restrictions for the cabin luggage of different airlines. The ideal solution for your short travels may be having this carry-on as your main suitcase and a backpack for your personal items. And you will be allowed to take both on board anyway. And generally speaking, the two should be enough for an average person going on a week or 10-day trip for leisure or business. You can put this in the overhead locker and the backpack under your seat. Having said that, for its size and weight, it seems to carry quite a bit. And it feels solid and durable and is easy to move around, push and pull. You can put your small items like toiletries and liquids into the small zipper bag and other stuff in the larger zippered mesh pocket. It also includes the tie-down straps that you can adjust, so you can keep your clothes and other stuff in place and in order. The only thing to note is when you use the extender and fill the luggage with lots of stuff, it may not fit in the overhead locker in some cases. For the reasonable price tag concerned, you’re getting decent value for money. Please note that the box that gets shipped via Amazon.com will show the contents clearly.